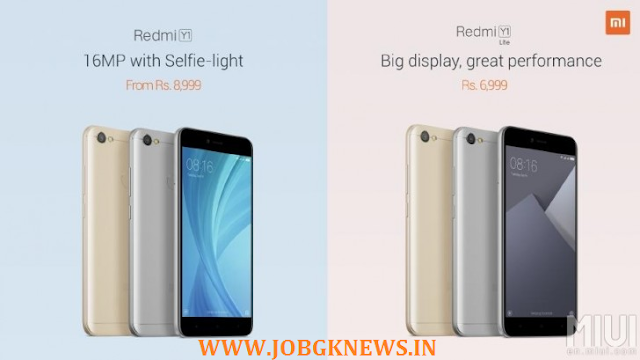 Xiaomi Redmi Y1 Mobile, Y1 Lite Mobile launched Today in India | xiaomi redmi y1 price | xiaomi redmi y1 review | xiaomi redmi y1 specification. Xiaomi India on Today launched the selfie-centric Redmi Y1 and Redmi Y1 Lite smartphones and announced the release of the global version of MIUI 9 — an upgrade to its customised Android-based operating system. ₹10,999 for the 4GB RAM and 64GB storage variant. Redmi Y1 Lite is the cheaper sibling in the selfie-centric series at a price of ₹6,999. Both the smartphones will go on sale starting November 8 on e-commerce site Amazon.in. 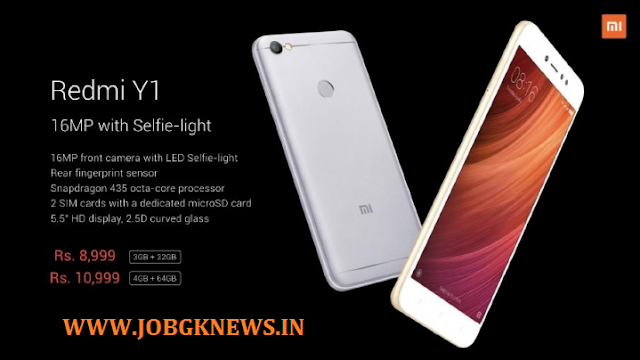 Redmi Y1 is Xiaomi’s first smartphone in India which features selfie light and a 16MP front-facing camera. It has a 13MP f/2.0 rear camera. The device has 5.5-inch HD display with Corning Gorilla glass and is powered by a 3,080mAh battery. Redmi Y1 houses Qualcomm Snapdragon 435 octa-core chipset, a dedicated micro-SD card slot and dual-SIM (nano+nano) slots. The fingerprint sensor is placed at the rear of the device. Meanwhile, Redmi Y1 Lite features an octa-core Qualcomm Snapdragon 425 processor, sports a dedicated micro-SD card slot with dual-SIM (nano+nano) capabilities and 5.5-inch HD display. Similar to Redmi Y1, the smartphone features a 13 MP f/2.0 rear camera and is powered by a 3080mAh battery. Meanwhile, the MIUI 9 upgrade will start rolling out from November 3, starting with three devices —Mi Max 2, Mi Mix 2 and Redmi Note 4 smartphones. The update includes India-specific features such as a “panchaang calendar”, Indian festival cards and IRCTC card that makes SMSes by IRCTC easy to read. According to Jai Mani, Lead Product Manager, Xiaomi India, MIUI 9 will be as fast as stock Android OS. The new OS based on Android Nougat also supports three major style notifications which are multiple styles, bundling notifications and quick replies.